Folkmanis 2979 - Equipped for the long haul across the deserts of Arabia, this dromedary stands on gangly legs waiting to carry you to your oasis. 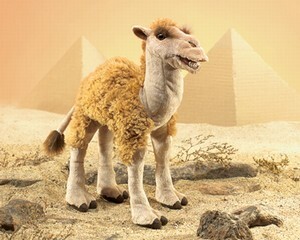 With sandy colored plush fur and a workable mouth, this CAMEL PUPPET assures you'll never be thirsty for love! Movable mouth. Puppet measures 16" x 6" x 17".